August, 21st 2013. Sunny and bright day. 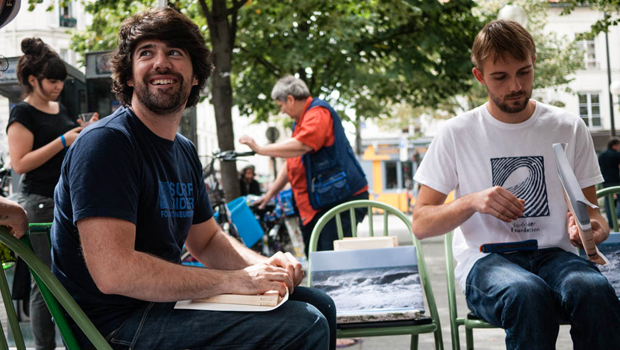 At different hours, Montebelo/Surfrider members and artists start to arrive in Paris. Vienna at 4pm, Frankfurt at 9pm, Stuttgart at 11pm and Hossegor at midnight. Beside the team who was already in Paris, we all have one goal together for the day after: to watch the performance of the Brazilian graffiti artist Zezão at Le M.U.R. 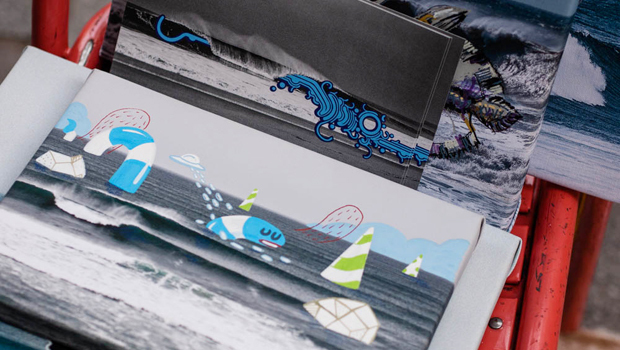 and organize a jam art session with artists, who generously created artworks for the Surfrider Foundation, an organization that aims to protect our beloved oceans. Zezão, an artist who emerged from the pixação scene on the suburbs of São Paulo in the 90’, came to be the first Brazilian artist to perform at Le M.U.R. During a tour in Europe for 2 months, which includes projects in Frankfurt, Kassel and London, plus a solo exhibition in Basel, Zezão found 4 days in his schedule to come to the city of light, which has also the strongest underground scene in the world. Since 2007, every 2 weeks Le M.U.R. brings a new artist to perform at this open sky gallery in Paris. Two weeks ago, at the end of the European summer, when many people were out of Paris enjoying the beach, we brought a sense of nature to add to Zezao’s performance. 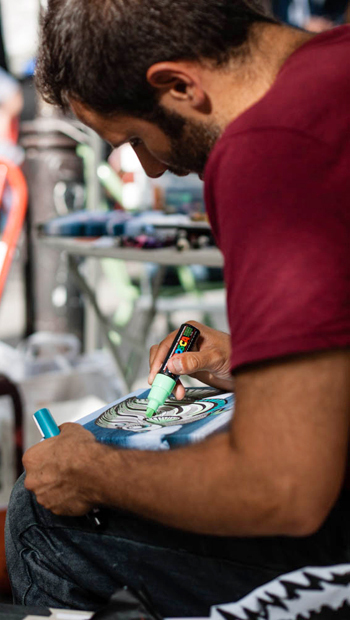 Working with the agency Montebelo and excited to have Zezão in Paris for a few days, painting his light blue flop around, which reminds the idea of clean water and peace, we thought: why not putting together artists with grateful hearts to do something for the planet? 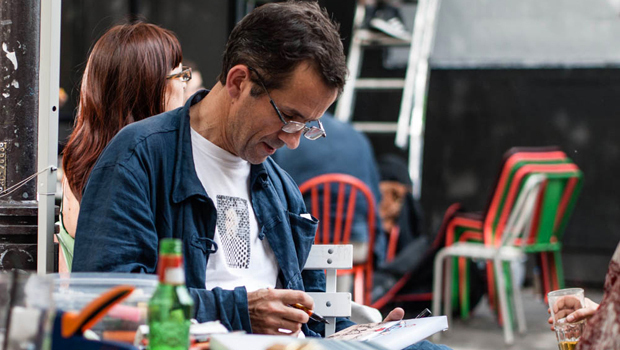 We discussed the idea with the artist Jean Faucheur, who founded Le M.U.R. and other important artistic movements in Paris, and he got interested to work on the project. 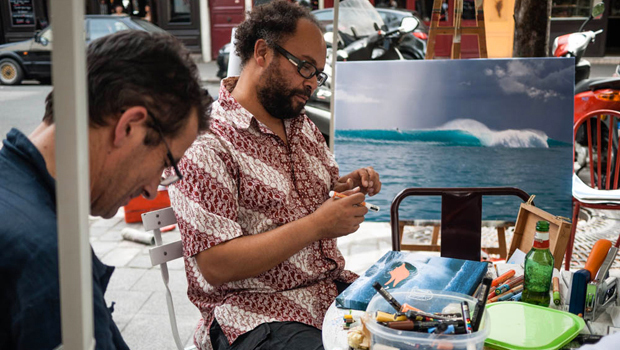 We invited other artists and some of them put their energy to make the project possible, like Gilbert, Rafael Suriani, Quentin de Waele, Jean Faucheur, the protagonist of the day Zezao and also Dominique Larrivaz , who passed by during the afternoon and donated his talent spontaneously. 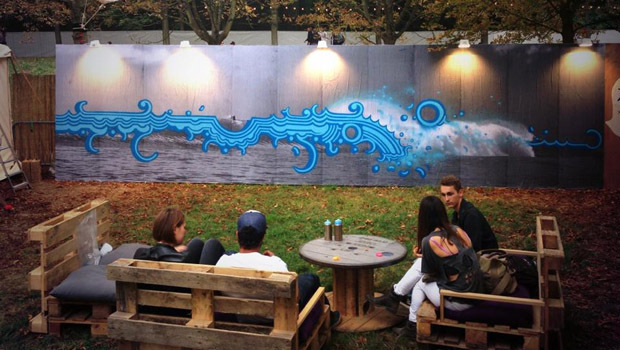 The main idea: artists creating canvas on the streets under the theme “Protection of the ocean”. 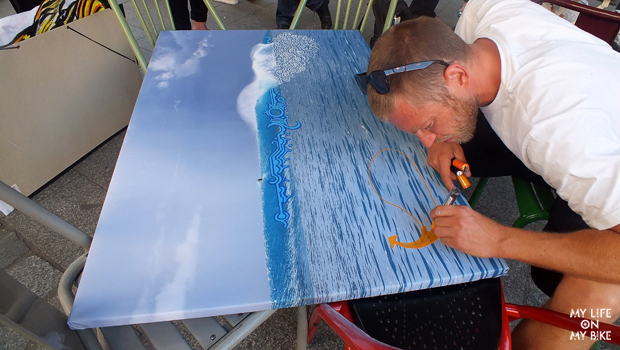 The result: 19 photos of waves on canvas were transformed through different means and were donated to Surfrider Foundation. 22nd of August: it was a special, creative and blue day in Paris. But the adventure with this great team of co-works and artists did not end here. The following days were unforgettable as well. That breeze friday morning was promising a special day. I came with Zezão to visit the French artist C215 at his home in Vitry-sur-Seine, who are friends from other Carnivals (a Brazilian expression for old friends). 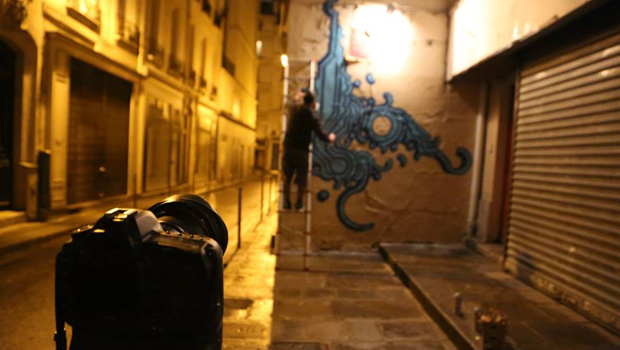 C215 invited Zezão to paint a wall at this small town, full of art on the streets, on the suburbs of Paris. This wonderful afternoon inspired by the C215 love for his community and town, was ended with a Bike Ride at Midnight in Paris with Montebelo fellows (check the pictures here). 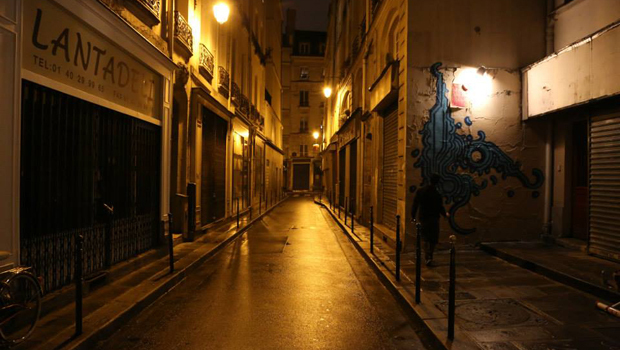 Even during the dark of the night I could feel Paris soft and blue…. 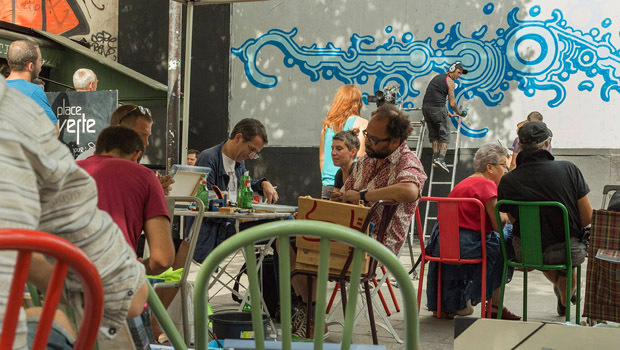 On the day after, another mission: to paint a wall at the Parisian festival Rock in Seine. 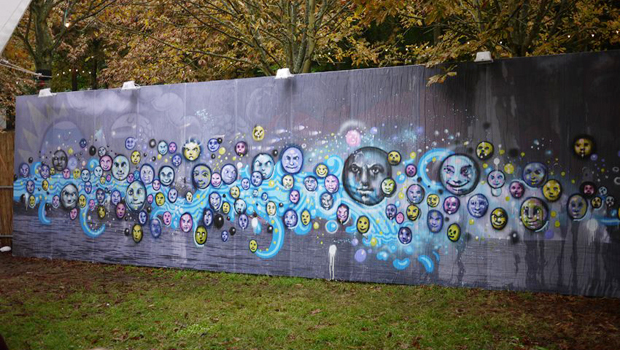 The festival, which had also the wave as theme, invited the artists Zezao, Jean Faucheur and Gilbert for a live painting. Even with the leaves on the floor at the Parc de Boulogne, reminding us that autumn is coming soon, the blue flops of Zezao brought light to Paris. My time to say: J’Adore! 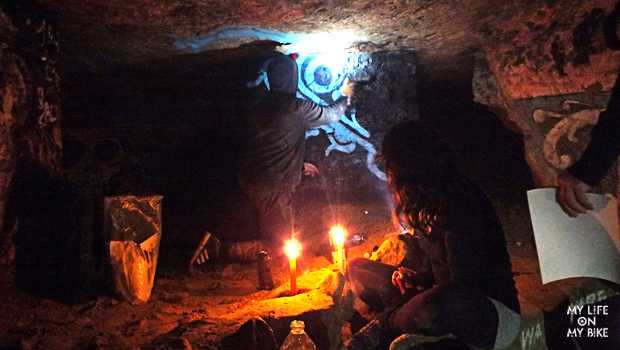 But that Saturday was a long and extraordinary day….At 11pm, I went with Zezao and the Montebelo team to meet ”Psyckoze“, the king of the Parisian Catacombs, for a visit at this literally UNDERGROUND world. 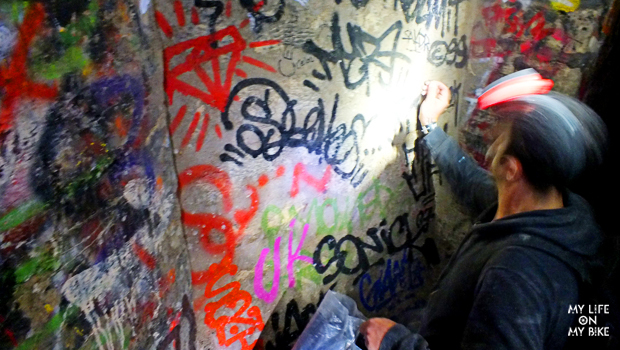 With a guided visit with Psyckoze at the Catacombes, I discovered a parallel universe, full of graffiti and mystery. 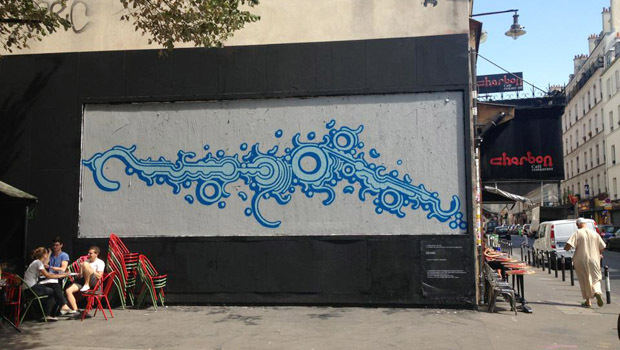 Zezão, who was called by Psyckoze as his “alter ego in the city of Sao Paulo” (in Brazil, Zezão is the king of the sewers), was living his 3rd visit at this place, but the first with Psy, who goes there often since the last 30 years. 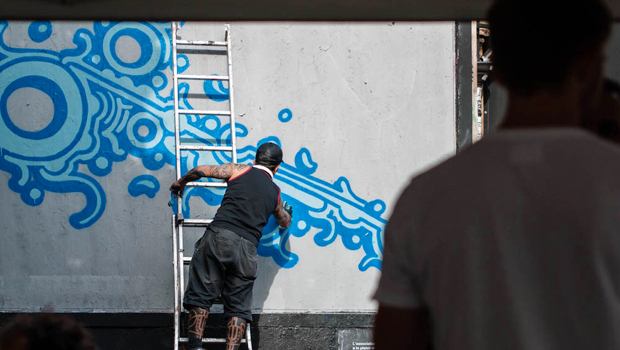 It was a legendary moment and naturally Psy offered a wall to Zezão to paint and also a space for one tag in a wall that has the energy from many graffiti artists from all over the world. We left the Catacombes in a raining, bucolic Sunday morning. I’m still processing this extraordinary experience – next week, Montebelo will present a video documentary of this visit and I will try to expose my raw feelings of fear, with contradictory peaceful moments. This strange and raining Sunday was quite of magical. It was cold, silent, introspective and to finish Zezao’s visit in Paris we came to the picturesque neighborhood of Le Marais. 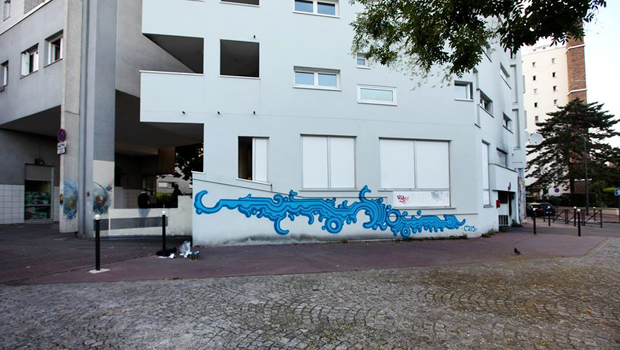 Zezão was invited by Xavier Faltot, who runs the gallery Le Chapon Rouge, to paint a wall in an area where graffiti doesn’t exist. Surrounded by the yellow illumination of Paris at night, in a completely empty street, Zezão left his last blue organic forms in the city. “C’est magnifique”, said Xavier Faltot. What does it mean to spend 4 days with an underground artist who also built a career in the fine art world? Is it just about the art itself? Is it about the technique? Is it a matter of colors, whether I like blue or not? Is it complex? Repetitive? What does it mean? To an artist who emerged from the graffiti scene, we can’t forget to ask: What is the life history of the artist? And in Zezao’s, case the main question should be: What is the reality of someone who grew up on the suburbs and favelas in Brazil? What is the point of graffiti art? It’s important to say that even if Paris has a strong urban art scene, it all started in the 60’ with the nouveau-realism, followed by the art-posters in May 68. Black Le Rat put his first stencil at the 14th arrondissement in Paris in 81, much before Banksy. 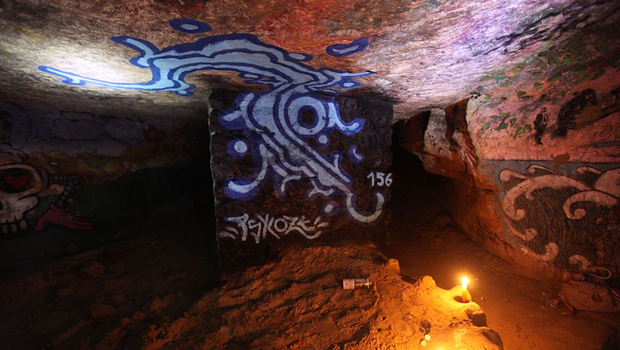 In 1984, JoneOne created the graffiti crew 156, which includes Psyckoze, but it was in the 90’, a decade when Paris was led by graffiti artists, that Zezao (and many other Brazilian pixacao artists) got completely influenced by the French movie “Dirty Hands”. I mean, Paris has a strong influence over Zezao’s career. Inside trains and metros, traveling around with Zezao, I could feel his body shaking of will to intervene. “Oh no, the graffiti train is completely out my dear”, I said. Walking on the streets, every time Zezao would see a manhole, he would check if it was possible to open, a desire to go to the underground every time. Feelings and attitudes that are in his blood, even 20 years on this path. A true out-of-the-system as an artist. While experiencing those days full with gratitude with Zezão, I was reminded that this movement, which includes exacerbated “ego” aspects with rivaling gangs, vandalism and most of the time an expression of cholera, I asked myself: Why does this universe fascinate me? And suddenly I remember the wise words of Jean Faucheur…. Read my interview with Zezão made last April for Underground Paris here.